Japanese gardens have been fascinating and enchanting people for thousands of years with their incredible aesthetic appeal and relaxing atmosphere. For a western viewer, no feature better encompasses these attributes than their beautifully designed bridges. 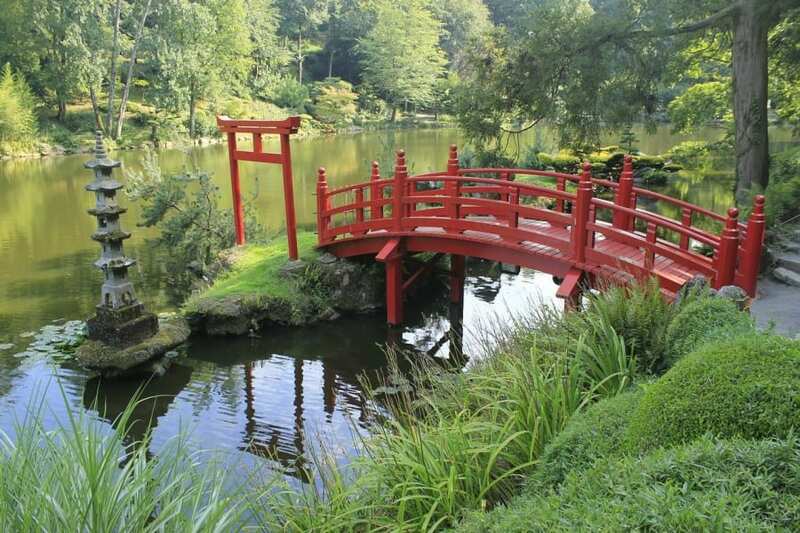 Interestingly enough, however, the bridge did not begin to appear in Japanese gardening until the Heian Period, over 200 years after the conception of the Japanese garden itself. It’s a testament to its design that it has become one of the most important features in Japanese gardening, both for practical reasons and the spiritual meaning behind these structures. Bridges, of course, have a strong relationship with ponds, streams, and waterways, all of which are important aspects of Japanese gardening. By extension, bridges have become, in their simplest form, a practical tool to move guests from one ‘island’ to another. Japanese bridges can be built from a variety of materials such as wood (sori bashi), stone (ishibashi) or even bamboo or earth, and can come in a variety of shapes and sizes. However, because Japanese gardening relies on the concept of a harmony between man and nature, even the most practical garden accents such as bridges must fit flawlessly into their environment. This means that, depending on the size of the waterway, a Japanese bridge may be as plain and as simple as an uncut stone slab laid over a stream. Japanese gardening is designed to engage and be engaged with and the use of bridges is no exception. The true significance of a Japanese bridge is not merely practical but has strong spiritual connotations that help the visitor to engage in a more meditative experience while exploring the garden. The spiritual meanings of Japanese bridges can range from deeply religious sentiments rooted in Buddhism, to a more Taoist philosophy inspired by Chinese culture. The crossing over the bridge symbolizes the journey between the mortal world into the afterlife, and the cleansing of one’s worldly burdens that follow. Through this journey, the individual experiences a symbolic sense of purity, inner peace and a unity with nature. With the rising influence of Zen, crossing the bridge was also interpreted in a broader spiritual sense that placed more emphasis upon the journey between the world of man and the world of nature. This symbolism shares many similarities with the directly religious interpretations, especially with the concept of man travelling to a higher plane of existence. In this case, the higher plane is the natural world, as opposed to a spirit realm. Perhaps the most iconic of all Japanese bridges is the arched red bridge or Guzei. The bridge itself is laden with the same symbolism as any other, yet the color red has spiritual connotations all on its own. Red is an important color in Japanese culture, and in this case represents wisdom, transformation and all that is sacred. Red is also a color heavily intertwined with Zen, and so further encourages the individual to reject their attachment to physical things on their journey across the bridge. With both its structure as well as its color, the Guzei offers the individual a spiritual experience that works on multiple levels and encourages positive growth, spiritual change, and transformative experiences. Japanese bridges, as with the Japanese gardens as a whole, are designed to offer a meditative and self-reflective experience. Of course, not every single individual who experiences a Japanese garden will have extensive knowledge of Buddhist or Zen philosophies, and you may not feel transported onto a higher plane of existence as you cross a Japanese bridge. However, Japanese bridges are masterpieces of design and exist to help encourage the visitor to feel at one with nature. Most importantly, whether it be physical or spiritual, the Japanese bridge is symbolic of a journey. The subjectivity of this is key, as it allows for each visitor to experience this journey in whatever way they choose. Author’s Bio: James Stedman works for Japeto, a family owned business which offers an extensive selection of handpicked, high-quality Japanese gardening tools developed for professional and amateur gardeners, such as the hori hori knife, trowels, and rakes.